Some of Britain’s biggest supermarkets were forced to remove dozens of frozen items from their shelves due to a deadly outbreak of listeria earlier this year, costing the market thousands in recalls. But it’s not just bacteria that poses a risk. Here, Chris Johnson, managing director of food-grade bearing supplier SMB Bearings explains the importance of food safe lubricants in food processing equipment. On average, product recalls cost food and drink manufacturers $10 million in direct costs. This does not include immeasurable losses, such as those caused by delayed orders, inventory losses and any profit reduction caused by reputational damage. Following a recall, manufacturers are required to assemble a crisis team, remove the product from the shelves, investigate the cause and of course, manage the media. This listeria outbreak was identified by European Food Safety Authority. Due to the high-risk nature, consumers were advised to return the products to retailers immediately, while the factories affected halted production. However, not all recalls are caused by breaches in health and safety in processing. In fact, some manufacturers may be entirely unaware they are putting their consumers at risk through chemical contamination. According to data from Australia’s Food Standards Agency, chemical contaminants and biotoxins accounted for 55% of product recalls between 2008 and 2017. A potential cause this this contamination is due to unwanted contact with unsafe lubricants and greases used in machinery. Back in 2000, tests of a Heinz baby food product revealed it contained a toxic substance. Further tests clarified that the food has encountered a mineral oil lubricant during the manufacturing process. But, this was almost two decades ago, and a lot has changed regarding regulations and legal requirements since then. 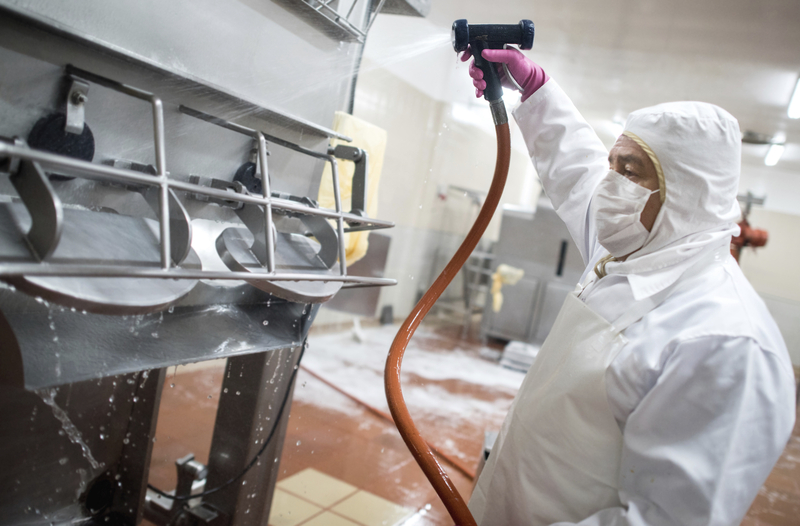 Lubricants used in food processing machinery must be formulated to be innocuous in taste and odour, and should not pose any kind of health risk to consumers should contamination occur. Currently though, there are no pan-European regulations for the formulation of lubricants use in food processing facilities. However, most lubricant manufacturers abide by rules set by the United States, the Food and Drug Administration (FDA), which lists acceptable lubricant components in its Title 21 Code of Federal Regulations (CFR). In fact, there are now classifications of different food-grade lubricants, including the H1 and H2 standards set by public health and safety organisation, NSF International. H1 lubricants describe greases that be used in applications where accidental food contact may occur but would be limited to a trace amount. This is the classification usually referred to when opting for a ‘food-grade’ grease. These lubricants can only contain certain bases and thickeners that are pre-defined by the FDA’s regulations. H2 lubricants on the other hand can be used in a food processing facility if there is no possibility of contact with a food product. While these lubricants should not encounter a consumable product, their ingredients are still heavily restricted by the industry. These lubricants cannot contain any carcinogens, mineral acids or intentionally heavy metals. Choosing a H1 or H2 lubricant will depend on the application. For example, if the lubrication will be used in a sealed bearing, which should have no direct contact with food, a H2 lubricant could suffice. In fact, SMB Bearings provides a re-lubrication service to clean and refill bearings for the food and beverage industry to ensure they contains the right grease for the job. Stainless steel ball bearings, for example, can be supplied with either H1 or H2 non-toxic lubricants, on request. Food manufacturing can create a harsh environment for lubricants and greases, and this should also be considered when choosing H1 or H2 lubricants. The lubricant will need to withstand the ingress of water and steam cleaning, not to mention the cleaning chemicals that are often used in food manufacturing. In these instances, it is advisable to speak to an expert in food-grade bearings and lubricants, before simply opting for a H1 grease. Bearings may seem like a small consideration when you consider the mass issue of recent food recalls, but the message is clear. When manufacturing food and beverages, every component in the facility should be chosen to create a risk-free manufacturing environment. This includes the smallest parts, including every bearing and its lubricant.